1. CLEARANCE TO LAND GIVEN! This is a interesting Venus Production release. Only nine Songs are giving to the Elvis fan, with four previously released recordings, but five new ones to us. 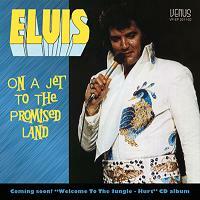 "On A Jet to the Promised Land" starts with take one of 'Promised Land'. It's a short version, which runs only 2:32, in great sound. At the beginning we hear Elvis struggling with the mic and changing the lyrics at the end. The whole thing sounds more like fun than a real recording. Elvis is lauging and talking while James Burton is playing the first break. A interesting version. Great to have the first take. The first take of 'There's a Honky Tonk Angel' was released before on Essential Elvis Vol. 5. Here the sound is not as strong as on the Essential CD, but more clear, which is good and gives another feeling in my point of view. The second take is a false start and pretty short, but new to our ears. It sound like Elvis is a little bit too far in the background while the guitar is very clear on the left channel. Take three is also new and sounds very good. But Elvis is unable to end the song without messing it up. Still, a great song and a great take. 'My Boy' has always been one of my favourites by Elvis. I think take one is better than the master and the other takes. Here we have take one and two, already released on the FTD release Good Times. We know that Elvis was tired of singing the song in the studio, but enjoyed performing it on stage. At take one you can hear that he sung it like on stage. Take two and three bored him. I think the sound on the Good Times FTD is better. Again, here it seems that Elvis is a little bit too far away in the mix. Take one of 'Love Song Of The Year'! I waited quite a while for an outtake of this song – and I got a very good one! It's quite similar to the master, but the sound is very good – almost like an undubbed version of the master – and it's interesting hearing Elvis finding the way into the song. Take four of 'Your Love's Been A Long Time Coming' is, in my point of view, better than the master take. This take is not new, since it was released on Essential Elvis Vol. 5 some years ago. The studio talk is different before the song starts. We hear the announcement “take 4”, and Elvis singing the line “A Litle Less Conversation”, then he wants to talk with David (Briggs) and then suddenly the band beginns to play. However, the sound here is not as good as on Essential Elvis vol. 5. Also one of my favourites is 'Thinking About You'. Here we have take three, which sound very good and shows us Elvis hard working on a track he enjoyed. In my point of view this take is better than take four – released on Essential Elvis Vol. 5 and the master (take 8). This take has already been release on Made In Memphis by FTD. I'm a very huge fan of Elvis' 70s recordings, and since FTD has not yet released a Promised Land CD with outtakes and stuff, I appreciate every new outtake from this December session of 1973. But is it necessary to release a CD with only five new tracks and a total running time of only 30:46! ?